Will My Tax Debt Be Discharged Under Chapter 7 Bankruptcy? Discharging old tax debts is a major goal for many Americans who have fallen behind on paying taxes. 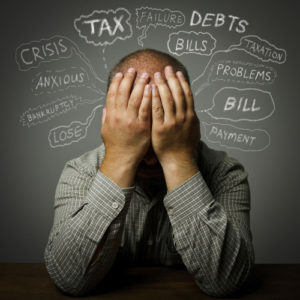 Much of the public mistakenly believes that filing for bankruptcy will automatically clear all debts including tax debts, but this isn’t always the case. You may be able to discharge certain tax debts when filing for Chapter 7 bankruptcy, but many non-income-related tax debts will not be cleared. The only types of taxes that may be discharged under a Chapter 7 bankruptcy case are income-based. Additionally, these tax debts must have been due at least three years prior to filing for bankruptcy. There are certain conditions that must be met for the income taxes to be eligible for discharge. You must have filed the tax return at least two years prior to filing for bankruptcy, the taxes must have been assessed at least 240 days from filing for bankruptcy and you must be found innocent of any acts of willful evasion or fraud. Unfortunately, you won’t find relief for most non-income tax debts when filing for a Chapter 7 bankruptcy. This includes tax liens, some employment taxes, recent property taxes, third-party taxes and erroneous tax refunds. Since opening his law firm in 1995, bankruptcy attorney Joel R. Spivack has helped hundreds of clients find financial relief with various debt relief options. His experience with Chapter 7 bankruptcy cases will prove invaluable in your fight to get your financial future back on track. Attorney Spivack understands that you don’t need false hopes but a real, workable plan for the future. He will use his knowledge and experience to help guide you through your entire bankruptcy process and ensure you completely understand every step. Chapter 7 bankruptcy will help stop wage garnishments, home foreclosure, car repossession and harassment from collection agencies. Call 856-488-1200 or fill out our convenient online contact form to learn more about getting started on discharging your debt.